LG has finally sorted out the LG G5 app drawer controversy by making it possible for users to activate an old-school app drawer on their device. Between the metallic modular design, the dual-camera on the back, and the LG Friends accessories, the LG G5 is unique in more than just one way. On the software side, the LG G5 also differs compared to most Android smartphones in a notable way: LG's new flagship doesn't feature an app drawer. 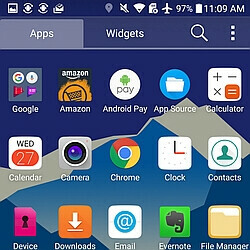 Understandably, many Android loyalists criticized LG's decision to remove the app drawer and adopt the Apple iPhone's everything-on-the-homescreen philosophy. Although those who couldn't be separated from the app drawer have been able to download an LG Home app from LG's SmartWorld app store, the downside to this solution was that the Smart Home app drawer is actually designed using the G4's UX 4.0 design language, and not the modern UX 5.0 design featured by the LG G5. Through this new update for the LG G5, the company is finally bringing a UX 5.0 app drawer to its flagship smartphone. As you can note by glancing at the screenshot below, there's nothing actually interesting to report. This is the same app drawer that Android users came to know and love. To download and activate the new LG G5 app drawer, you'll need to head on over to Settings>About phone>Update Center>App Updates. Here, you'll find two new app updates available for download: one for "Home & app drawer" and one for "Home selector". The first is the new app drawer, and the other is the intermediary tool that makes the switch possible. Just download both, and the next time you press the home button, you'll be able to activate the new app drawer. What do you guys think? Now that the LG G5 comes with a built-in app drawer, are you likely to activate it on your unit? I asked a few mobile phone stores in my city, and they haven't sold any G5's. The app drawer really didn't matter especially when you could easily install a launcher to get one. So it didn't matter if LG added it or not. The Oppo F1 didnt have an app draw either, and it was released before the LG G5. Saying the LG G5 is unique because it didnt have an app draw is wrong. Again iPA failing to pull the facts from the fiction.. It is unique not from other Android devices but it's own previous models and predecessors. Is it weird that I kinda like it with no app drawer? Why not just use Nova Launcher? Much more powerful. The icons looks old and ugly I don't understand why LG doesn't use stock android it's much better than this. LG aren't even selling the G5 here in New Zealand.